?Grande Montre Marine? Construite par Louis Berthoud, Horloger de la Marine No. 130, ?Grande Montre Marine?, begun in July 1809, finished in January 1811, sold to the Comte de Rosily (for the Department of the Marine) on October 8, 1811. Very fine 2 day-going, marine chronometer à tabatière, with regulator dial. Accompanied by a later mahogany box. C. Two piece (back lacking), tabatière, gilt silver with glazed bezel secured by two screws fitted in mahogany, three-piece, unglazed bezel in the middle part, top with circular ivory plaque, lock between the bottom and the middle parts, sliding brass shuttle in the base panel. D. White enamel by Vincent, eccentric radial Roman hour chapter set at 12 oclock, center minutes with five-minute Arabic markers, subsidiary seconds. Blued steel Breguet hands. 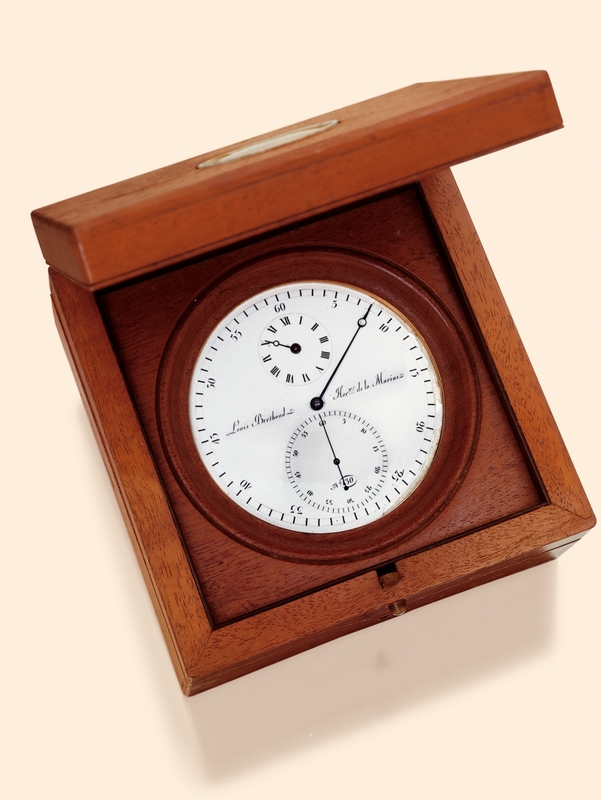 One of the last large marine chronometers made by Louis Berthoud. Their manufacture in later years was entrusted to Berthoud?s pupils. Louis Berthoud?s work is always unmistakable in its conception as well as in its finish. For details of the clock?s production, see ?La Longitude en mer à l?heure de Louis Berthoud et Henri Motel?, by Jean-Claude Sabrier, Antiquorum Editions, Geneva, 1993, p. 560 and p. 145, for the illustration of a similar chronometer. This lot was previously sold by Antiquorum , Geneva, in November 2001, lot 258.